Benjamin Robert Thompson (1896–1916) served with the 11th Battalion the Suffolk Regiment (known as the ‛Cambs Suffolks’) during the First World War, and was wounded by a shell at La Boiselle on the second day, 2 July, 1916, of the Battle of the Somme. 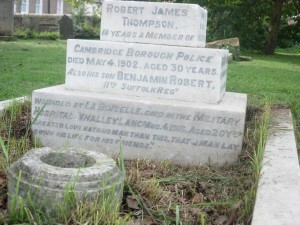 He died of his wounds on 4 August 1916, at the age of 20. Benjamin’s battalion, which had been formed in Cambridge in 1914, took part in one of the major battles of the First World War: the Somme, close to the Belgian border in north-eastern France. That battle lasted from 1 July to 18 November 1916. The 11th Battalion the Suffolk Regiment went to La Boiselle in May 1916, and was part of the bombardment of the Germans on 1 July in which 57,000 British casualties were sustained. The battalion lost 190 of its men on that day, with 337 casualties. –From his sorrowing Mother, Father, Sister and Brother. NB For a poetic monologue about Benjamin by © Kay Blayney, please click on the download.